Last time, we discussed how Proto-Indo-European branched off into many descendant Indo-European languages, a number of which developed written forms that we can now translate, giving us clues to the people who spoke them and how they lived. We described several important languages that developed over the centuries, up through the Phoenician alphabetic writings. Today we’re going to look at two major descendants of the Phoenician language, Greek and Latin, which are important precursors to many of the languages spoken and written around the world today. The earliest surviving written evidence of a Greek language is Mycenaean, one of the over 3,000 dialects of ancient Greek. We find it primarily on the clay tablets and ceramic vessels discovered on the isle of Crete. Mycenaean did not have an alphabetic written system; instead, it had a syllabic script known as the Linear B script. The Greek phonetic alphabet evolved sometime after the fall of the Mycenaean civilization in 1200 BCE and prior to the rise of Ancient Greece in 800 BCE. Researchers have dated the first alphabetic Greek inscriptions to the early 8th century BCE, about the time when Homer’s epics, the Iliad and the Odyssey, reached their present forms. By the 5th century BCE (from 480–323 BCE, known as the Classical period), Athens had risen to cultural supremacy. As a result, despite the many Greek dialects, only the Athenian dialect, known as Attic, became the standard literary (written) language. The most famous works of poetry and prose that have survived until the present time – penned by writers such as Aristotle, Euripides, and Plato – were written in Attic. The Greek alphabet went through a number of revisions early in its history, but it has been in continuous use in some form since its inception. In fact, it is considered to be the precursor of all European alphabets. 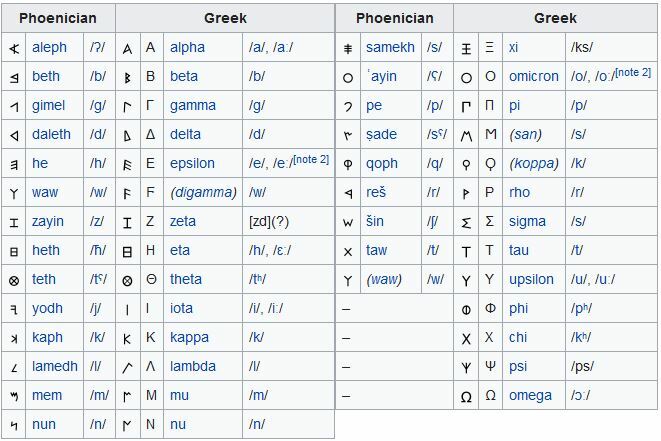 In adapting the Phoenician alphabet, the Greeks kept most of the letters’ names and sounds, but they also made several critical modifications and created additional letters necessary for the Greek phonology. As we’ve seen, the Phoenician script contained only consonants, but the Greek alphabet contained both consonants and vowels. The Greeks therefore used some of the not-required consonants to represent the required vowel sounds. As an example, the Phoenician consonants aleph, he, yodh, ayin and waw changed to the Greek vowels alpha, epsilon, iota, omicron, and upsilon, respectively. The Greeks also added three new consonant letters – phi, chi, and psi – to the end of their alphabet. All of the Phoenician letters had specific meanings – aleph meant ox, bet meant house, etc. But while the Greeks adapted the names of the letters, those letters did not represent any specific meaning to them. The only exceptions are that o micron and o mega mean small o and big o, and e psilon and u psilon mean plain e and plain u. Many local variants of the Greek alphabet developed, individualized according to the new letters added to the original Phoenician script. The two main subdivisions were the Western (Chalcidian) and the Eastern (Ionic). The Western alphabet eventually gave rise to the Old Italic and then the Latin alphabets, while the Eastern became the basis of the Modern Greek alphabet. During the Hellenistic period, the time of Alexander the Great’s empire building, the Greek language spread throughout the conquered territories. Of necessity, it adapted and incorporated the various local dialects; linguistic changes gave rise to a new language form called Hellenistic Koine, a simplified language used by the common people from 300 BCE to 300 CE. Greek was originally written right to left and vice versa in the boustrophedon (literally, “ox turns”) manner; successive lines moved in alternate directions. By the Classical period, though, it was written left to right and top to bottom. Lowercase letters first appeared after 800 CE, developing from Byzantine script, which developed, in turn, from cursive writing. Capital letters of Modern Greek are almost identical to those of the Ionic alphabet. The Greek alphabet gave rise to the Latin, Gothic, Glagolotic, and Cyrillic alphabets; probably influenced the Armenian and Georgian alphabets; and donated some letters to the Bactrian, Coptic, and Nubian alphabets. Greek symbols are used in the modern world in both mathematics and science. This branch of the Indo-European languages was predominant in the Italian peninsula. The Italic people were not natives of Italy, however; instead, they migrated to Italy by crossing the through Alps around 1000 BCE and gradually moving southward. Latin is the most famous language within this language group. It was originally a small local tongue spoken by tribes living within small agricultural settlements in the center of the Italian peninsula. The first inscriptions we have found in Latin date back to the 7th century BCE; by the 6th century BCE, the language had spread significantly. Rome was responsible for the major growth of Latin in ancient times. Classical Latin is the form of Latin used in the most famous works of Roman authors like Ovid, Cicero, Seneca, Pliny, and Marcus Aurelius. Today, Romance languages are the only surviving descendants of the Italic branch; all other offshoots, such as Faliscan, Sabellic, Umbrian, South Picene, and Oscan, are extinct. To read Part 2 (Egyptian hieroglyphics), click here.